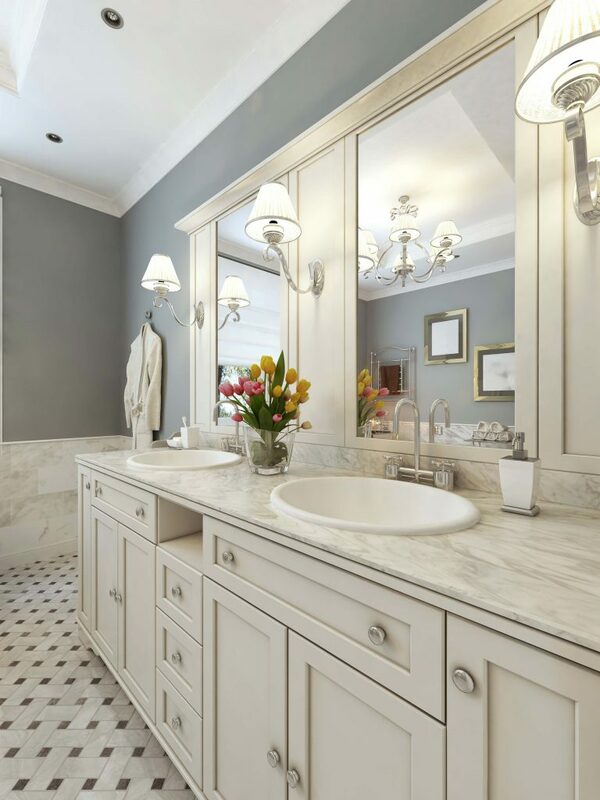 Wether you are remodeling or decorating your large or small bathroom, view our guide on bathrooms including vanities, cabinets, sinks, tile ideas and more. Powder room, toilette, lavatory: no matter what you call it, your bathroom is one of the least public rooms in your house, but also one of the rooms where design is critical to your comfort and happiness. 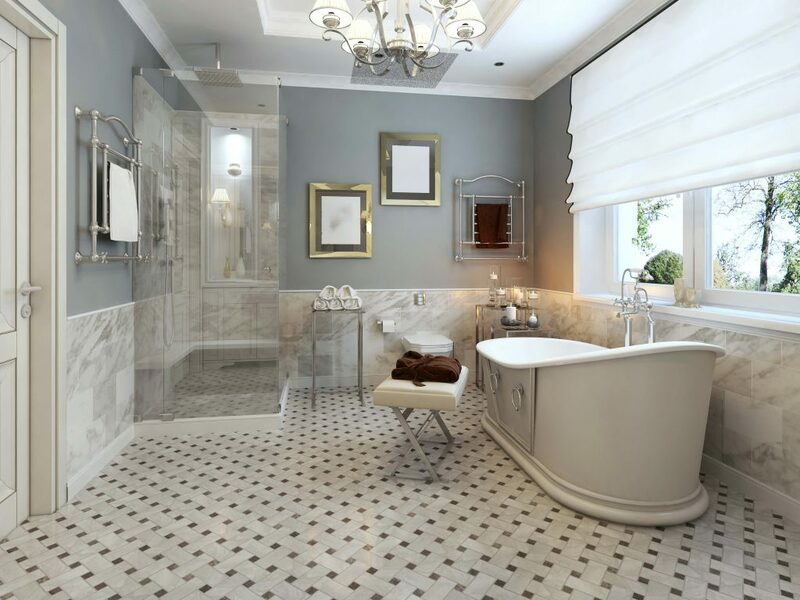 Redesigning your bathroom can feel like a lot of time and effort for such a small part of your house, but when the project is finished, the results are always gratifying. 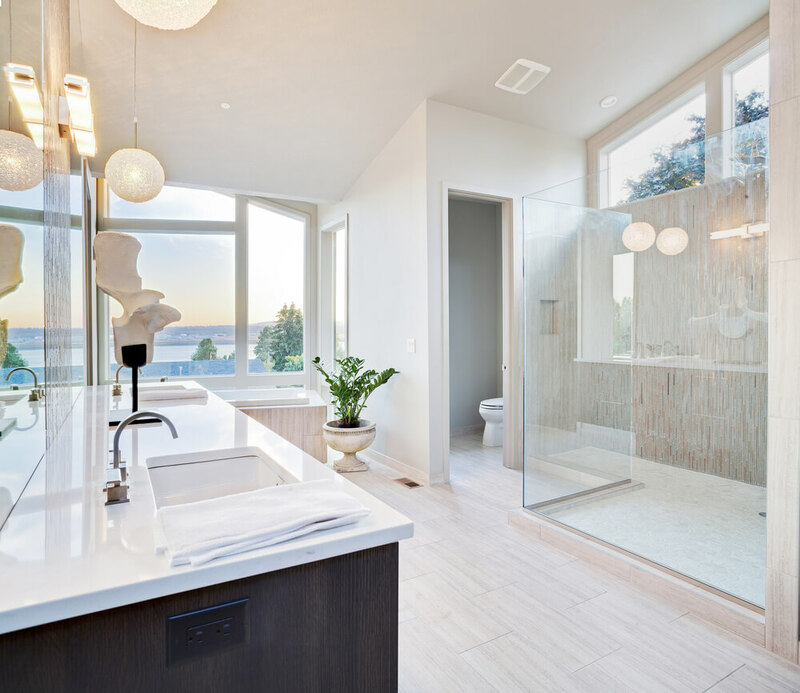 Renovating a master bath or guest bath can add a lot of value to your house if you’re looking to resell, but it can also make your family life just that much more enjoyable: whether it’s bath time with the kids, a solo bubble bath at the end of a long day, or just a hot shower after a sports game, having a space where you can relax and unwind is more central to your happiness than you may realize. 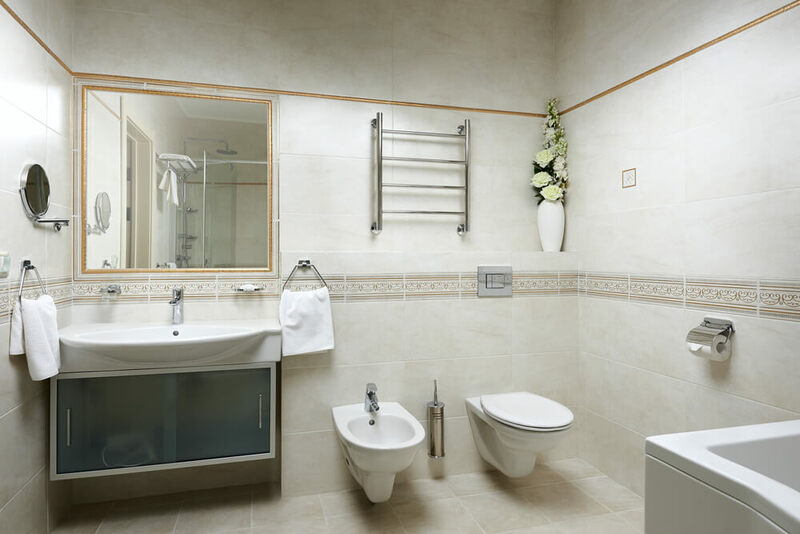 The bathroom is also a space where you can begin to understand your taste in decor and design aesthetic. It’s a small enough room where you can be bold without being overwhelming, private enough where you can experiment with a new design, and interesting enough where you can really play around with a lot of aspects in the room (sink, vanities, cabinets, tile, etc.). Read on for our guide on how to go about strategizing how to remodel your bathroom. This guide gives you tips on everything you need to know from tile to tub. Finding the right storage for your bathroom is a tricky balance between good design and functionality. You want to make sure you have space for all your towels and bath accoutrements, but also pick a vanity or cabinet with style. 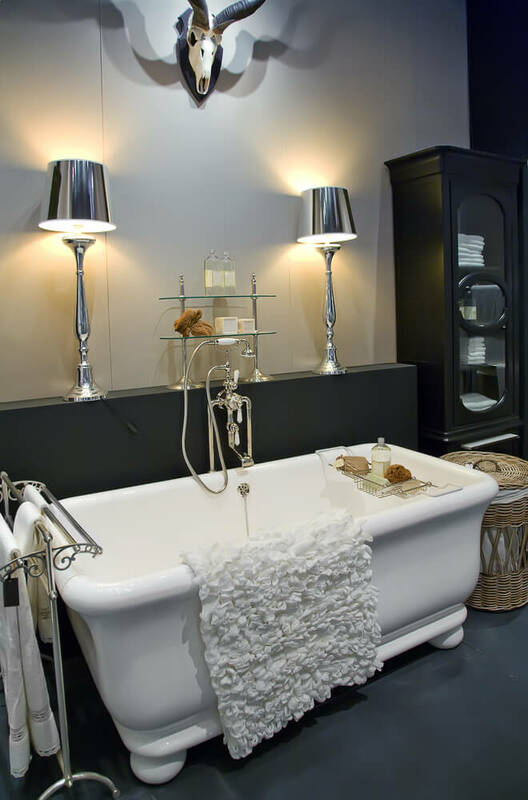 Some bathrooms can be quite small, so get creative when maximising your space. 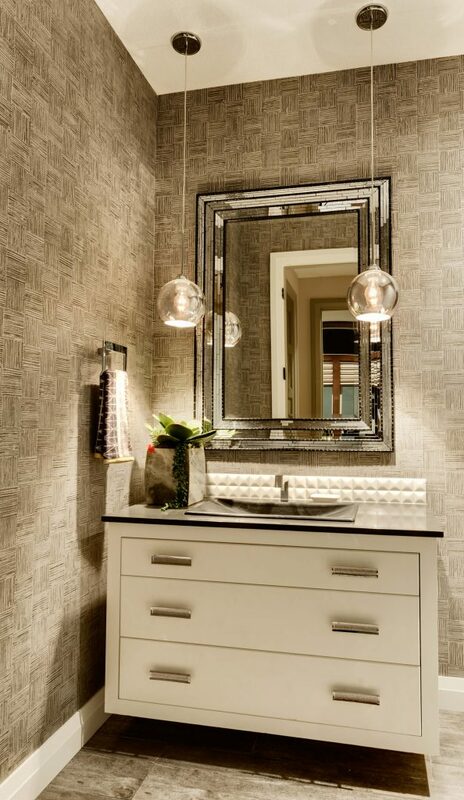 When done well, a vanity can really pull the room together. The trick is to make sure the size of the bathroom vanity is proportional to the size of the room and other bathroom fixtures. 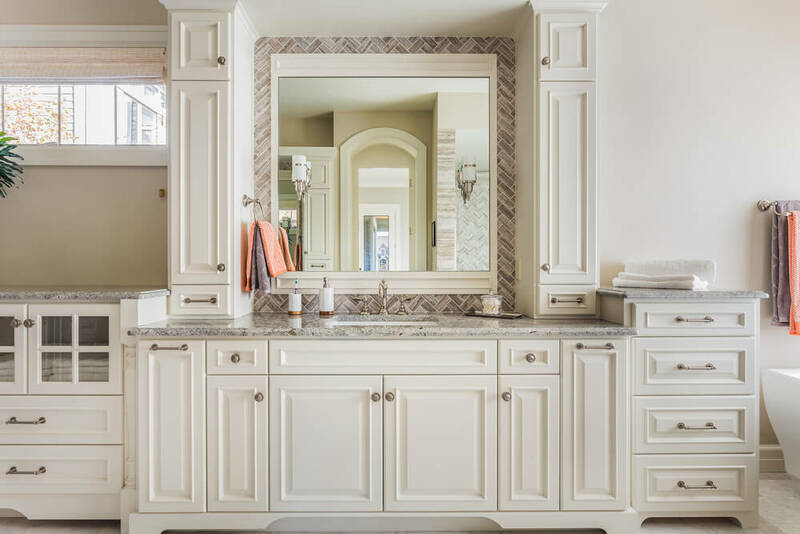 Before selecting a vanity, consider whether you need a vanity or cabinet (more about cabinets in the next section) and take measurements of your room to see if you really have the space you think you do. Keep in mind the space you’ll need to open and close your vanity’s doors (as well as a shower door or door to a bedroom). Typically, smaller bathrooms or a guest bath would include a single vanity, and the master bath can fit a double vanity. For more bathroom vanities check out home depots wide selection. Much like kitchen cabinets, bathroom cabinets can be found in four basic forms: ready-to-assemble, stock, semi-custom, and custom. A vanity, which we covered in the last section, is a freestanding cabinet. 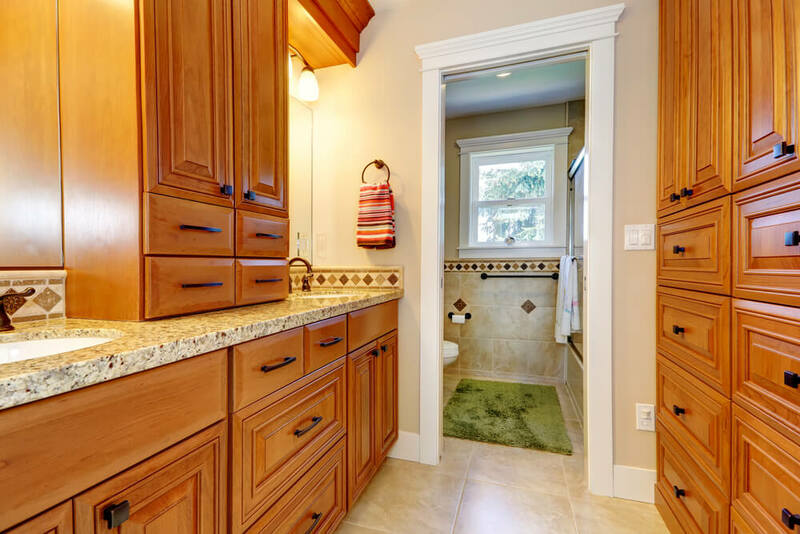 Bathroom cabinetry is as simple or complicated as you wish it to be: from stores like Lowe’s or Home Depot, you can find plenty of options to fit your budget and the size of your room. Ready-to-assemble cabinets are the least costly, but the most amount of work: if you’re feeling handy, you can save a bunch of money doing your cabinetry yourself. But, you do risk building cabinets with lower-quality material. Stock cabinetry is the next most cost-effective option; the downside is that you will find very little variety in terms of style. If you want to choose cabinetry that’s long-lasting and tailored to your specific taste, we suggest going for custom or semi-custom cabinets. While pricey, this option gives you the flexibility to customize the hardware, color, material, and style of one of the most major aspects of your bathroom. If you’re doing a remodel, pay special attention to your bathroom fixtures. These are some of the things that can quickly go in and out of style, so make sure when you’re planning your design you take into account current trends as well as personal taste. Depending on how advanced your remodeling project is, you could be limited in your style options; starting from scratch gives you free rein to choose the look you desire, whereas simply replacing the hardware means you have to take into account the size of the sink and the holes in the wall and existing sink. There are a variety of sink options for you to choose from, and each are customizable depending on your taste. 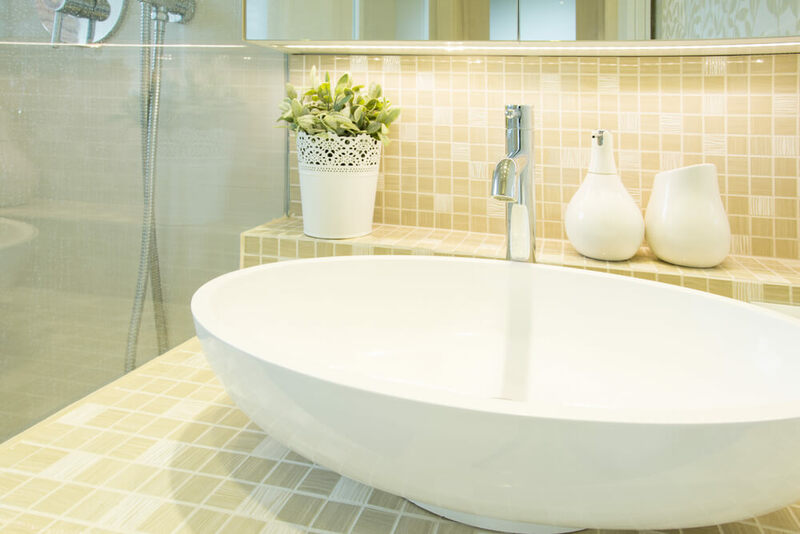 Think through who will be using the bathroom space– if you are planning for a master bathroom, having a double sink can save a lot of time and stress in the morning. If you have young kids (or for that matter, older family members living with you), consider adding a faucet with temperature control so they don’t burn themselves on hot water. There are four generally popular options to consider when choosing a faucet: single-hole, center-set, widespread, or wall-mount. Single-hole faucets are compact, with one handle connected to the spout. Center-set are the least expensive option and combine the handles and spout on one base. Experts say this option is best for a sink with a smaller basin. Widespread faucets are on the pricier side, and have hot and cold water valves separate from the spout. Lastly, the wall-mount faucet is a great option for sink remodels that don’t have traditional sinks with pre-drilled holes. If you prefer your sink to be minimalist and clutter-free, try a wall-mount faucet. 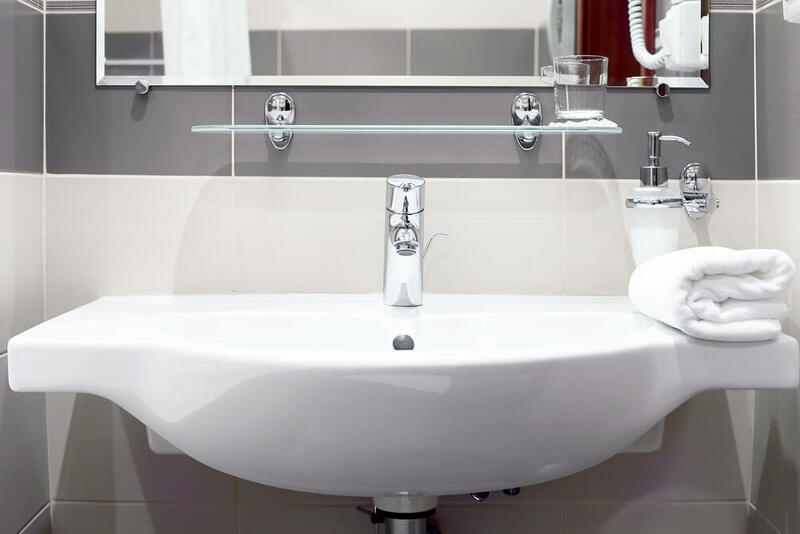 The sink basin is one aspect of your bathroom that can make a huge design difference. When coupled with the right tile, the sink really brings the room together. However, it’s also one of the most functional parts of the room and needs to be more than just a decorative piece. In the past, the sink basin was an afterthought. 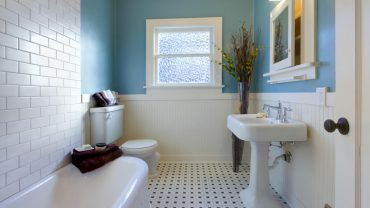 Now, it is en vogue for your home to have colorful or glass basins, or a more modern free-standing sink. 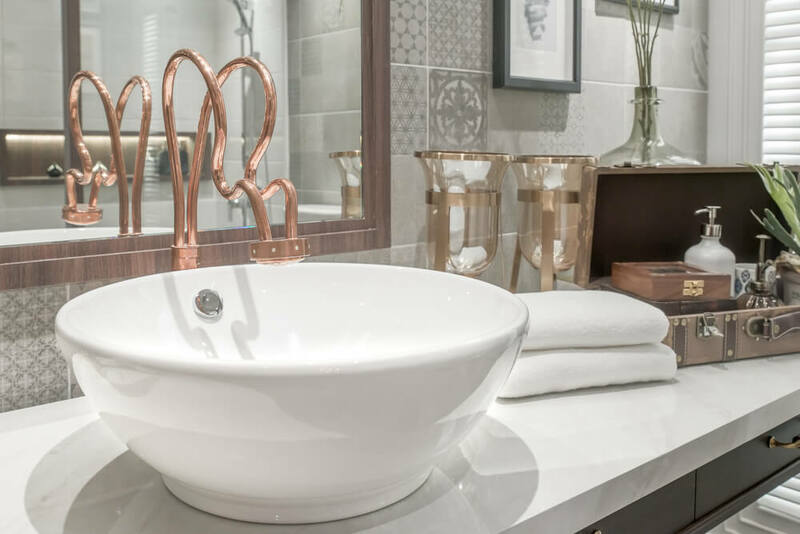 Newer homes have sinks in metals like copper or stainless steel, an option to consider if you’re looking to resell your house or have an affinity for a more modern, minimalist look. 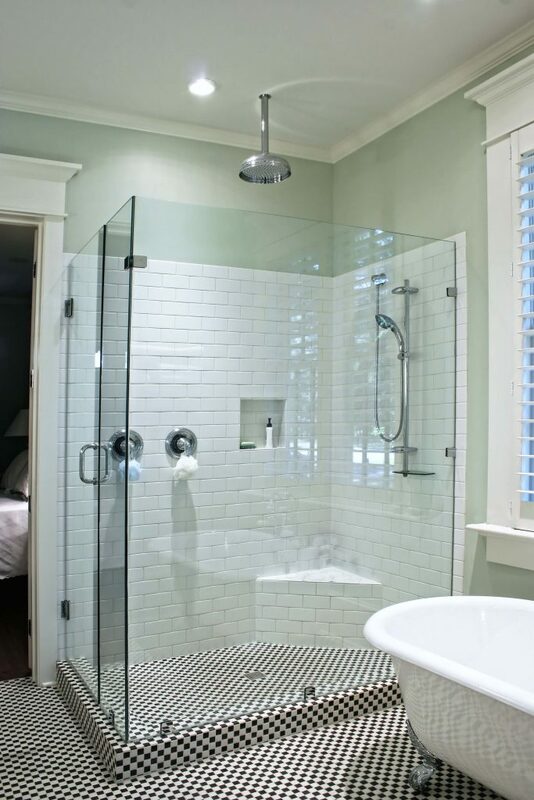 Planning what your bathroom is going to look like is the fun part of the whole remodeling process. This is the part where you get to tie the whole room together with tile, towels, shower curtains, etc. If you’ve put a lot of care and attention into your decisions regarding fixtures, this step is going to be the most gratifying. 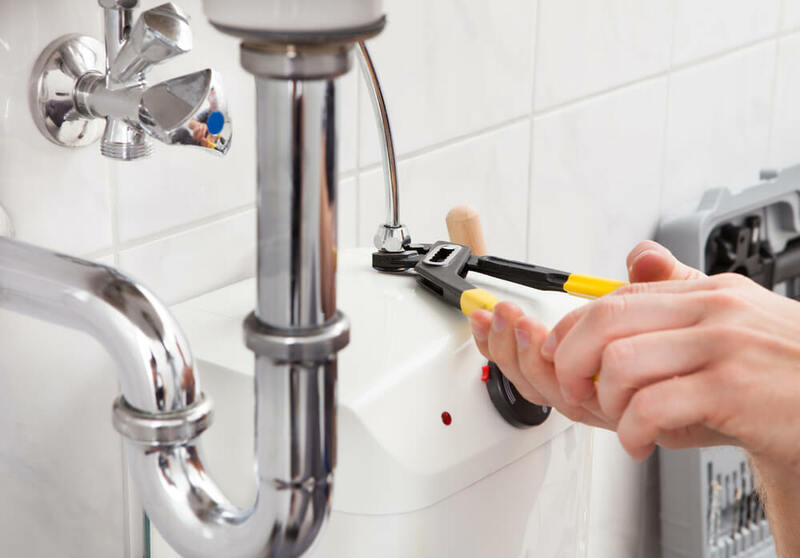 Though the value of your new bathroom lies in the new plumbing and storage you’ve invested in, the part that people will appreciate most when they visit your home is the look of the room. If you’ve been careful about selecting fixtures that are timeless and classic, this is your chance to add some personality or style trends to the bathroom. Make sure to set aside some of your budget for the fun part! Unlike your kitchen tile– like backsplash for example– it’s pretty much a given that your bathroom tile is going to get wet. One thing to consider when shopping for tile is a material with high slip-resistance, or maybe think about choosing an alternate material like wood or stone. Experts advise that if you have a curved space, try going for a smaller tile, since the smaller shape makes it easier to navigate small corners or curves. Bathroom tile also tends to be higher maintenance than in other rooms, mainly because of the moisture that comes with using a bathroom. If you hate cleaning, opt for larger slabs of tile (or, again, stone or wood) so you don’t need to constantly re-grout your bathroom. Also, if you have cleaning, consider a style that doesn’t show dirt easily. Though white bathrooms are all the rage, and can certainly add serenity to your shower routine, keep in mind that with kids or pets you’ll constantly be working on upkeep. Truly, tiles with neutral colors are a good option, especially if you choose tile over something like wood or stone. Keeping your tile low-key means the things you can more easily customize– like paint color, bathmats, or towels– will always match the rest of your room. Plus, having a natural or minimalist aesthetic in your bathroom means those long bubble bath’s will be good for your mind as well as your body. The hard part is done: you’ve picked your tile, your faucet, your sink, and your cabinets. The painful part of remodeling is behind you: now, it’s up to you to customize this otherwise utilitarian space to make it your own private oasis. Though it may feel like there are limited options in such a small room, there are a plethora of ways to add color, comfort, and character to this space. Consider adding some plush bath mats with a pop of color, or complimenting your new stainless steel sink with a matching tissue box or glass cannister. Here, you have the flexibility to try different bathroom items and see what fits with your character. Pull together the room with everything from a fancy soap dish to a new shower curtain (and, if that curtain is fabric, don’t forget to get a waterproof liner!). Now, fill up the tub, light a few candles, and enjoy your new bathroom!